We all dream of finding that special rock, one that is totally unique, one that can hold that center position on the top shelf of our mineral cabinet. Yes, that perfect piece we can be proud to display while telling the story of how we found it. In 1996, a geologist working for the Egyptian Geological Survey had his dream fulfilled. Aly Barakat was studying Libyan desert glass formed 26 million years ago, presumably by a meteorite impact, when he made his incredible find. As a geologist he knew that the colorful broken pebbles he found deep in the Saharan desert were unique, but it took more than two decades to learn how special they truly are. Several pieces of the Hypathia stone, discovered by Aly Barakat in 1996. So what makes them so special? The Hypathia stone (named after the famous 5th century woman astronomer, Hypathia of Alexandria) belied early interpretation. Its chemistry and mineralogy just did not match any known terrestrial or extraterristrial source. Originally it was thought that Barakat’s stones might have come from the nucleus of a comet that had fallen in the Libyan desert. 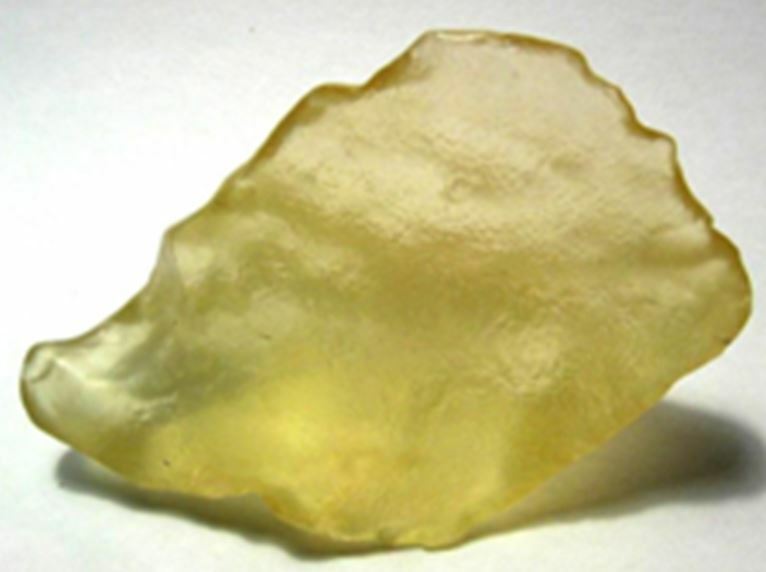 Further, it made sense that the impact, if large enough, could have generated the more common Libyan glass by melting the Saharan sands that it struck. But studies over the past two decades seem to preclude that origin for the Hypathia Stones. First, the stones contain too much carbon and almost no silica. This is contrary to all known extraterrestrial rocks. The answer, or at least the start of an answer, may have come from a very recent study conducted at the University of Johannesburg (Belyanin et. al., 2018). 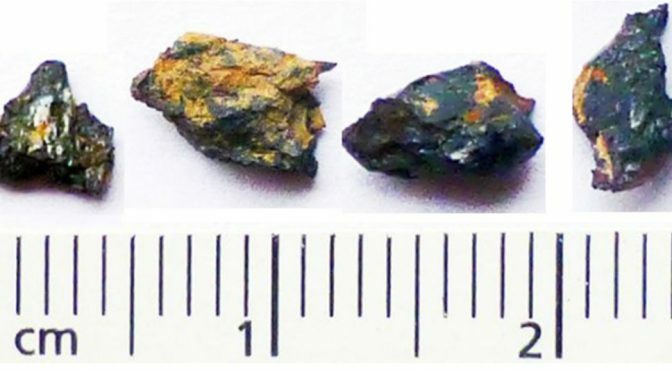 Working with infinitesimal grains inside the Hypathia stone fragments, the researchers found moissanite (silicon carbide), an unknown nickel phosphide phase, a silver iodine phosphide phase, and even native aluminum. Nothing like this is known from our solar system, causing Belyanin to conclude the that “these grains are unique within our solar system”. So what might this all mean? The South African researchers suggest that these sub-centimeter sized fragments may provide insight into our little region of the universe at a time before our solar system formed. In other words, more than 4.6 billion years ago. They suggest “the assembly probably occurred in the early solar nebula”. Apparently if they are part of our solar system, then theories on the origin of the solar system will need some revision. Needless to say these small rocks will be subjected to a bit more study. Maybe we should help these folks out by going to look for some more, maybe some bigger ones would be nice? Or maybe we’ve found some already and don’t know it? Just think, you could buy a grab bag for a buck at the show next weekend and discover a rock that predates our solar system. And then you would have fulfilled your dream. OK, maybe not, but I’m going to keep my eye open for sure. Maybe I can find one big enough to make a sphere? Belyanin, G. A., 2018 Petrography of the carbonaceous, diamond-bearing stone “Hypathia” from southwest Egypt: A contribution to the debate on its origin, Geochima et Cosmochimica Acta, v. 223, p. 462-492. Jorgenson, A., 2018, The Hypathia stone’s composition leaves researchers questioning where and how it formed, Astronomy online, Jan. 18, 2018. Ara Barakat was looking for and researching Libyan glass like this when he made his discovery. Dated at 26 million years old, this glass material also has an enigmatic history, although most favor an origin from impact features and fusion of sand. Could the Hypathia Stone and Libyan Glass tell a cause and effect story?